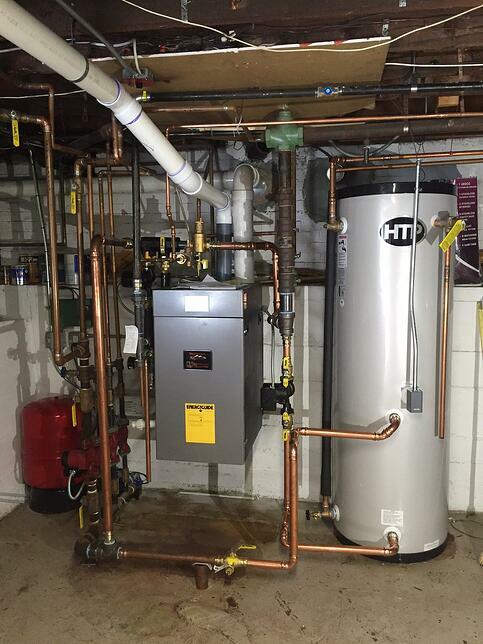 Check out the below installation of our highly efficient SuperStor Ultra done by the Zolotas Bros! The Zolotas Bros. have been providing plumbing, heating and remodeling services in the North Shore, Mass. area for over 25 years. The below photo is just one of the many great HTP installations they've done. The SuperStor Ultra Indirect Water Heater is a culmination of over 30 years of indirect system manufacturing experience. The 316L stainless steel tank construction resists corrosion and eliminates the need for anode rods, allowing for the system to be virtually maintenance free. The heater draws energy from a boiler and thus does not need its own heat source. Hot boiler water flows through an internal heat exchanger in the tank, heating the domestic water. The SuperStor boasts three to five times more recovery than conventional gas-fired or electric water heaters.